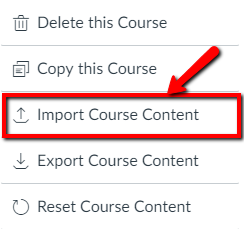 This document describes how an instructor can export course content from D2L and import it into a Canvas course. 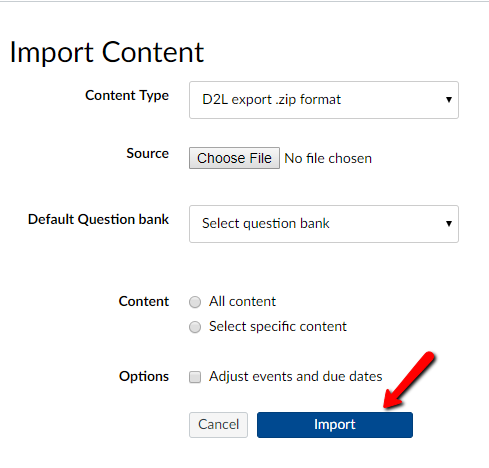 If you would like to export your D2L course materials yourself to import into Canvas follow the process below. Login to your D2L course. Click on Import / Export / Copy Components. If you have uploaded media files to D2L we recommend not exporting these to keep your backup to a reasonable size, and instead upload your media files to Kaltura My Media. D2L will display a Confirm Components to Export window. Click Continue. 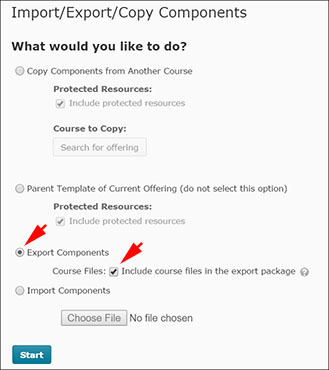 D2L will export the course components. Depending on the amount of material in your course this could take anywhere from a few minutes to a half hour. When it is complete click Finish. Save the zip file somewhere on your computer where you'll remember to find it for the next step. We recommend saving the zip file to your OneDrive. Canvas courses currently have a quota of 1024 MB. If your D2L export file is larger than 1024 MB remove some of the items from your course backup to reduce the file size. NOTE: Safari automatically unzips the zip file in to a separate folder, so you will have to turn off "Open Safe Files" before exporting (Safari-Preferences-General-Open Safe Files After Downloading). Click on Settings on the left-hand navigation bar. Next to Content Type click the drop-down menu and select D2L Export .zip format. Click Choose File. Navigate to the .zip file backup you created in D2L. It is likely you will want to check Adjust Events and Due Dates since it is probable you are importing course materials from a previous semester and the dates won't match up. Often it is easiest to select Remote dates but you can also select Shift dates. Make note of the issues to address in your Canvas course. Clicking on the highlighted issues will take you to that page in your Canvas course for you to edit. There may be non-highlighted issues as well that may not have an analog in your Canvas course. We recommend that you double check all of the material imported into your Canvas course. While content generally imports well there are some idiosyncrasies that require manual editing or updating.